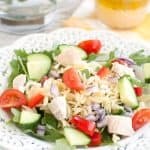 Chicken orzo salad makes a light and fresh meal. Filled with rotisserie chicken, vegetables, orzo and topped with a lemon vinaigrette dressing. The weather is warming up and the flowers are starting to bloom. Spring time is just around the corner. Woohoo – bring on the sun! Thinking about breaking out my warm weather clothing and eventually swim suit, makes me want to start eating a little lighter. I can’t hide behind my big sweaters any more. 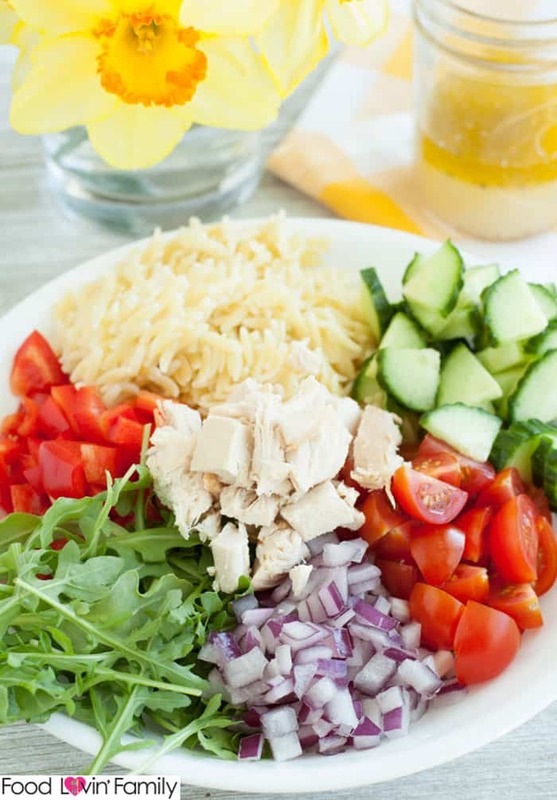 🙂 This orzo salad is packed with fresh vegetables, chicken, orzo and a tasty lemon vinaigrette – not to bad on the waistline. This is a satisfying meal on it’s own but is you left the chicken out, it also makes a wonderful side dish. 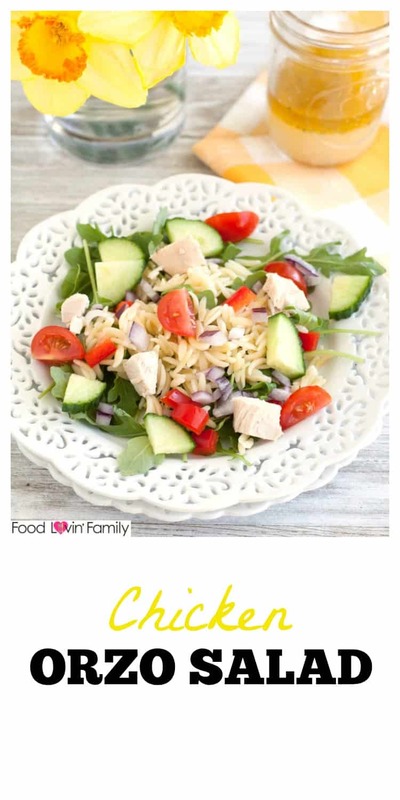 The recipe calls for rotisserie chicken because it is just so darn easy but during the summer I like making this salad with grilled chicken or even shrimp. This salad is really simple to put together. The hardest part is chopping the vegetables. I like to cut my veggies on the smaller side since the orzo is so small. A little crumbled goat or feta cheese also makes a delicious addition to this salad. For the lemon vinaigrette, simply add white vinegar, extra virgin olive oil, lemon juice, Dijon mustard, salt and pepper to a bowl. Whisk it up until all of the ingredients are combined. Drizzle it over the salad and toss to coat. Lately I have been trying to do more meal planning and packing lunches for my husband. I like making a big batch of this salad at the beginning of the week. It makes enough for my husband and I to have it for several lunches. Keep the vinaigrette in a separate container and pour on when ready to eat the salad. Another great option for salad on the go is this mason jar pasta salad. If you have a sweet tooth like me, be sure to try a slice of this apricot nectar cake or yum yum pie for dessert. Enjoy! 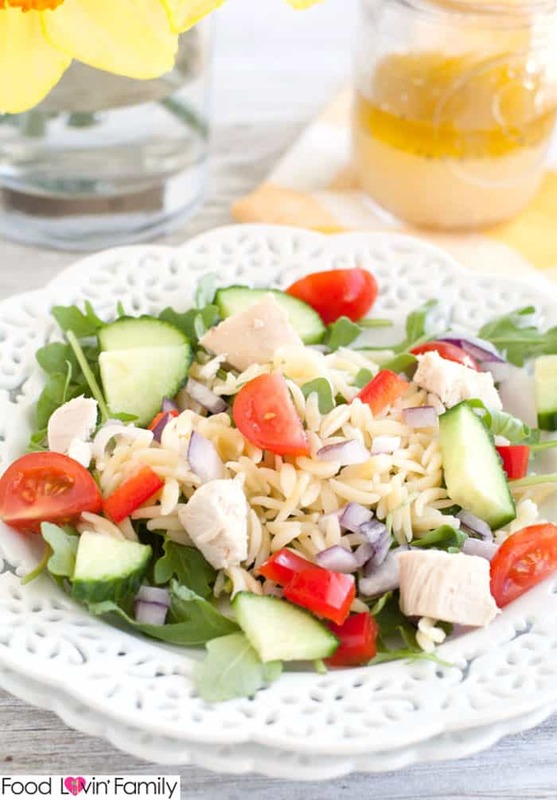 This healthy, fresh, and light chicken orzo salad makes the perfect lunch or dinner, especially when the weather is warming up outside! Combine pasta, chicken, pepper, cucumber, onion, arugula and tomatoes. In a small bowl combine vinegar, oil, mustard, lemon juice, salt and pepper. Stir with a whisk. Amazing and superb dish. Thanks for sharing this blog.